The latest volume features articles on: New excavations in the tombs of the Nobles at Luxor, Birgit Schoer reports on last season’s excavations at the tomb of Karakhamun at Thebes. How a mummy in an Italian collection is not all that it would seem to be. Craig Milner looks at the rare survival of a large number of model boats found in a Middle Kingdom tomb at Deir el- Bersha. Minoans and Mycenaeans in ancient Egypt: Marta Farrugia and Anton Mifsud look at the links between these ancient civilisations. Sailing the Red Sea: How a modern replica of an ancient Egyptian boat sailed in the wake of Hatshepsut. 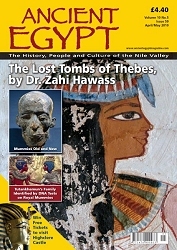 As well as all the latest Egyptology News and regular features. Often shown as a cobra, or as the head of the cobra, Wadjet can be seen rearing from the forehead of the rulers. Evidence of her protection is most notable upon the funerary mask of Tutankhamen. Occasionally, she has been shown in the guise of her "eye of divine vengeance" role, as a lioness.